Double Chocolate Caramel Cake…mmmmm, that just *sounds* so tasty, doesn’t it?? Feel free to decorate the outside of your cake any which way you like; I happened to have chocolate shavings on hand when I made the cake shown in the picture below, but this cake is just as yummy without them. I also apologise for the less-than-perfect decorating; this picture is a few years old now, and my baking and cake decorating skills have come a long way since then! Since I’m a purist when it comes to baking, I like to make my own caramel and simple syrup for this cake, and so I’ve added those recipes below. This cake takes a little longer to make due to the four recipes from scratch, but an easy way to reduce the time it takes to make this would be to make your simple syrup and caramel in advance. Both of these can be kept refrigerated for a while (caramel for up to 2 weeks, and simple syrup for up to 3 months). 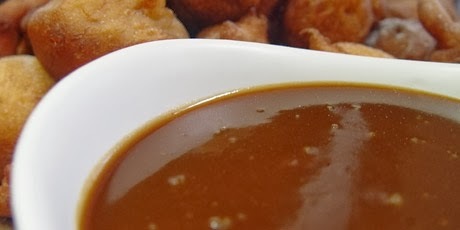 Just be sure to warm up your caramel to room temp well before you need it so it will be in more of a pouring consistency. Preheat oven to 350°F. Use ungreased, heavy-duty non-stick baking pans for this recipe. If heavy-duty pans are unavailable, double-pan to avoid burning. Sift brown sugar separately; discard lumps. Add to all other dry ingredients and sift into large bowl; stir well to blend. Mix vanilla, vinegar, and melted butter in a measuring cup; dig a hole in the dry ingredients and pour the liquid into it. Pour buttermilk over all, stir and blend until smooth and no flour is showing; do not over-mix or batter will toughen. Pour into pans immediately and smooth, then bake in centre of oven for approximately 30 minutes, turning and rotating pans halfway through baking. Cool in pan on cooling racks for 15 minutes, then de-mold on rack to cool completely. 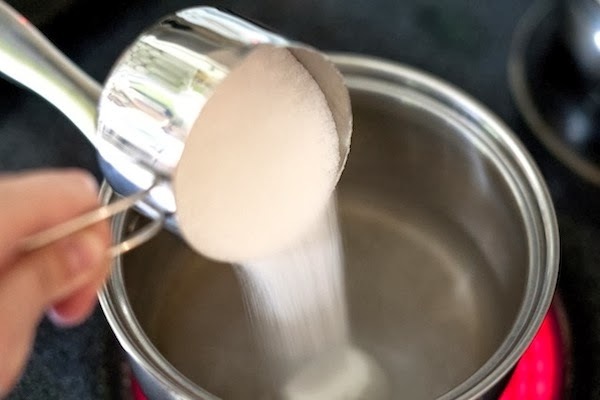 While cake is baking, bring sugar and water to a boil on stovetop; boil rapidly for one minute, then take off heat and allow to cool completely. Stir in vanilla extract. In a medium stainless steel saucepan with tall sides, mix water and sugar until mixture feels like wet sand. Brush down any stray sugar crystals on sides of pan with wet pastry brush. With heat on high, cook sugar water to boiling, until colour appears here and there in pan. Note, this will be a slow…slow…slow…quickquickquick! process, so keep an eye on your pan AT ALL TIMES. Do not stir the sugar water as it boils, or this may cause crystallization. Swirl pan gently until sugar syrup colour is deep golden brown. Take pan off heat, and very carefully whisk in cream. Caramel will foam up very quickly! (this is why you need a high-sided pan). This step can be dangerous — boiling sugar is extremely hot! — so have long sleeves on and prepared to step back. 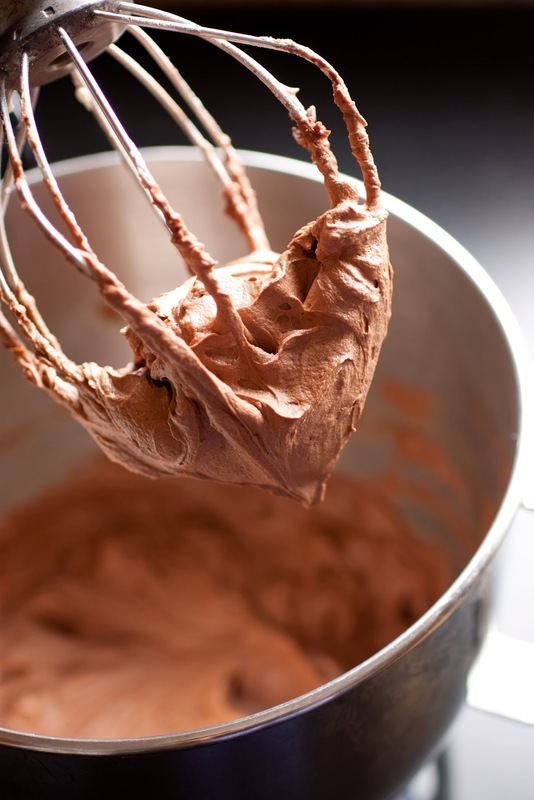 Put pan back on medium heat and whisk until it has reduced slightly and has a creamy, thick consistency. Turn off heat, add vanilla and stir in until thoroughly dissolved; allow to cool completely. (For safety reasons, I recommend you have ready a bowl of ice water to plunge your hands into if any caramel should land on your skin). Beat butter on high speed, scraping sides frequently, until light and fluffy. Reduce speed and beat in egg yolk. Add melted chocolate and mix in. Add vanilla, salt, and icing sugar. and beat until smooth. Level (cut off domed tops, if applicable) and torte (cut in half horizontally) both chocolate cake layers; using a pastry brush, “baste” each cut layer with simple syrup on top (don’t soak the layers, but use enough to make top of cake a little moist). Place one layer, basted side up, on cake plate or cake board; slather with about 1/2 cup chocolate buttercream and level top and sides. Drizzle a quantity of completely cooled caramel sauce over top of frosting, reserving 1/2 cup for final frosting layer. Repeat with two more layers, then place top (last) layer. Crumb coat (thin layer of frosting to hold any crumbs in) top and sides of cake; chill in fridge for at least 20 minutes. Frost top and sides with final layer of buttercream frosting. Decorate as desired; drizzle reserved caramel sauce over cake in desired pattern.